So, last night as we were working through the LXX text of Daniel 7, we came across an interesting term in verse 19, that is, the word κυκλόθεν. Of course, this adverb comes from the noun κύκλος, which means "circle." So, in Dan. 7.19, we read of an image of a beast stomping or trampling around in circles. In the Gospel of Mark, we get a different adverbial form (I'm not sure if the nounal form appears in the LXX or New Testament) in 3.34. There, were read: "καὶ περιβλεψάμενος τοὺς περὶ αὐτὸν κύκλῳ καθημένους λέγει..." A literal reading is something like: "And he was looking around at those circle-sitting (or, sitting in a circle) around him and he said..."
You may have already made the connection but it is this idea of "circling" (κύκλῳ) that originally contributed to the name & practices of the infamous Ku Klux Klan. However, the Klan members actually cannot be credited with creating the name. In fact, they took it from the college frat that was in existence long before (dating back to 1812) at the University of North Carolina, named OKA or Old Kappa Alpha, which stood for "circle of brothers." So, this "Greek Fraternity," actually did base its name on an ancient Greek word. 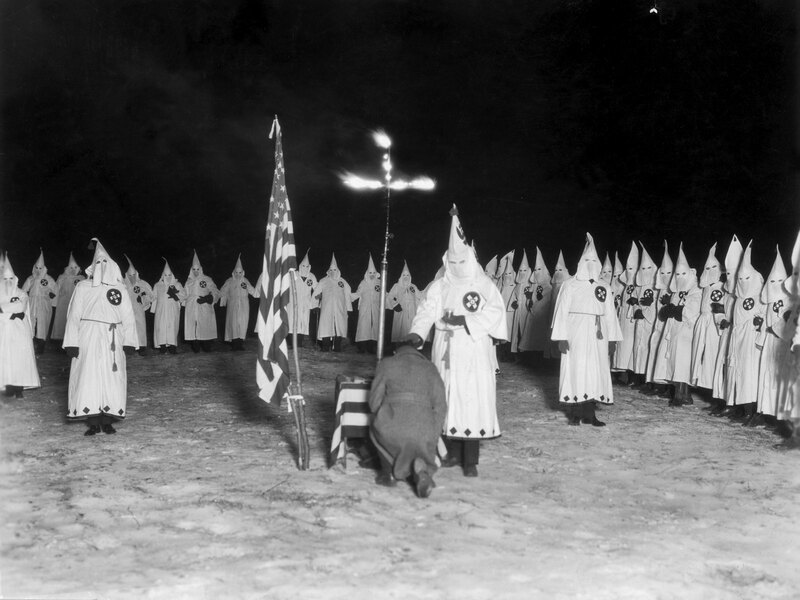 In the beginning, what is now known as the KKK, began as a social club who loved pulling pranks. Quickly, though, their agenda got more serious and in addition to looking after southern widows and orphans, they began striving to marginalize dark-skinned folk, especially at the voting polls. They soon realized that to be taken seriously, they would have to resort to violence and hate crimes. As you can see in the picture, the Klan is notorious for circling around a flaming cross (a ritual "call to war," based on the Scottish burning of St. Andrews' cross) in their meetings. In conformity with the group title, "the circling clan," leaders often made up similar nicknames for themselves such as Grand Cyclops. Before too long, these "monsters" and ethnocentrists were staging rallies and "calls to war" against southern blacks. Anyway, its amazing what sort of rabbit trails an ancient Greek word can send one on but I thought this was interesting enough to post about. In contrast to the hate-based meetings of the clan members, though, it might be beneficial to remember that in Mk. 3 when Jesus speaks of those "circle-sitting" around Him, it is in a context where He is naming all persons--Jews, Gentiles, males, females, sinners, saints and all alike--as His family members! What a wonderful truth and image! And what a wonderful notion to compare to what the picture the author of Revelation paints when he speaks of all God's people "circling" around His throne, every tongue tribe and nation together, praising and glorifying Him (Rev. 5.11; 7.11).